The idea for this trip started when I read (and then watched the movie adaptation) of Into the Wild in 2007 and was further compounded by a slideshow in Yosemite I attended in 2010 where a guy who had done the John Muir Trail twice shared his experiences and tips. I loved the pictures of stunning meadows & mountain passes and was captivated by his claims that once you hit day 4 or 5 your body acclimates to just hiking all day, every day. I wanted to know what that felt like. It sounded exactly like the kind of transformative experience that a person who tends to want to do things only when they’re extreme would be into. Spoiler alert: I am exactly that kind of person. From that moment on, I was eagerly talking up the idea of hiking the JMT someday. At 156 miles, it’s still a challenge and it covers 53 (and according to the authors, the most beautiful) miles of the JMT. I was drawn to it immediately because it’s a loop which minimizes risk of needing to schedule car swaps or transit to be able to get home when I’m done. The length makes the trip take just under two weeks instead of almost a month and that lets me take time off work with less stress about being gone for too long. Someday I hope to do some thru-hiking (AT or PCT) but BSL is a solid warm up for a newbie trying to do long distance hiking without a “quit your job” level of commitment. I also had a coworker’s husband’s spreadsheet from his JMT trip (he was a really good planner!) 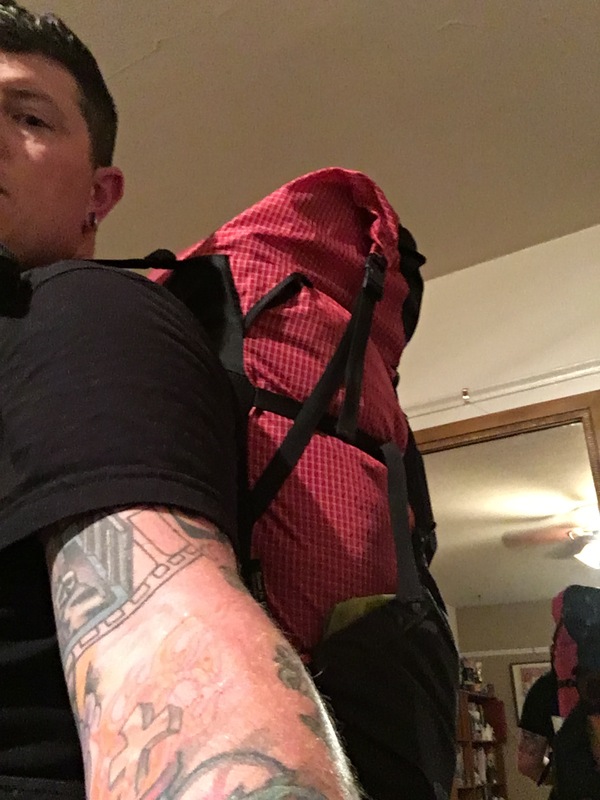 and learned from him about LighterPack which is a site that does the math on your pack weight (and makes for a great packing list) with support for categories like consumables and stuff you’re wearing instead of packing. Using this tool, I’m able to see that my base weight is only 25lbs when distinguished from my food/clothes I’ll be wearing. After a trip last Thanksgiving with my 30 degree down sleeping bag where I ended up freezing, I was advised to upgrade to a 10 degree bag which will better suit sleeping in the mountains at 10,000′. I’ve done a few trips now with the 10 degree bag and it’s perfect. In the month leading up to departure I was mostly focused on food planning. My initial approach was to try and aim for as many calories per ounce as I could in each item of food but I struggled to get 3000 calories each day to weigh less than 2 pounds. My first pass on food looked like it would be impossible to carry. Not only that but it become obvious pretty quickly that I was going to have to bring 2 bear canisters on the trip if all my food was going to be protectable (and meet park regulations). 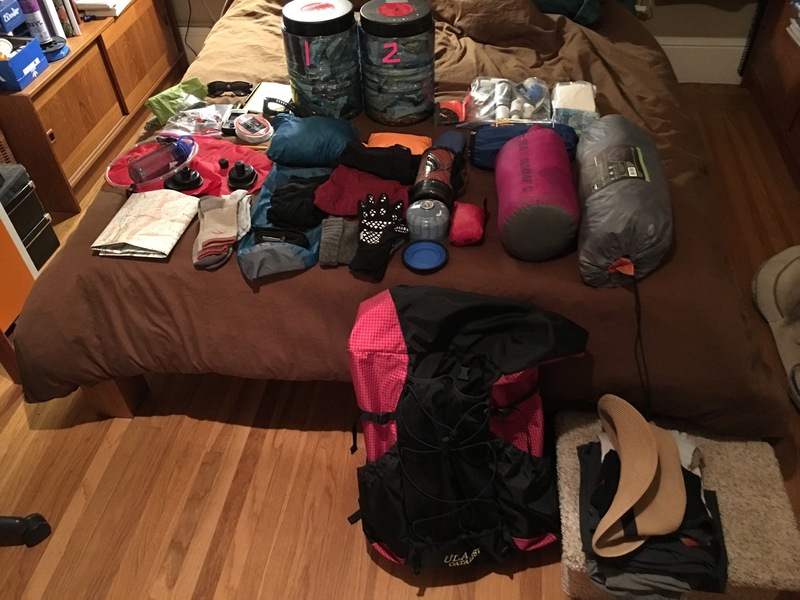 My experienced friend thinks this is funny and I can’t find much information on the web about other people doing it but by the numbers I’m still happy with my final pack weight and I’m using two 3 lb Bear Vault 500 canisters with a little room to spare in one of them for my toiletries. Also, as the one can empties out, I can fill it with other things so that my pack can get more compact. 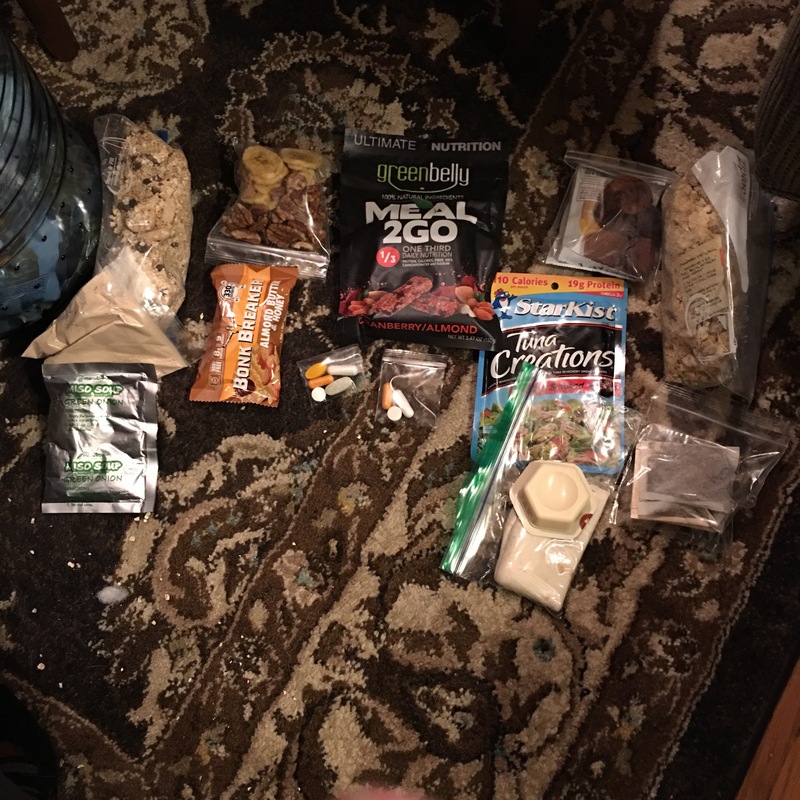 Last weekend’s trip made me realize I was putting too much oatmeal in my breakfasts (1 cup) so last night I spent a few hours finalizing my food packing with a new approach: what actually looked like enough food? Once I removed about 1/4 of the oatmeal, and pared down the snacks, each day’s meal fell between 1.7-1.9 pounds per day. This shaved over 10 lbs off my initial food packages. It meant I was able to get 5.5 days food into one canister and the remaining 4.5 days (my first day’s food will never need to be in a canister) into the other. Having my food packing working was a really exciting milestone in my trip preparation but this next part sealed the deal on increasing my excitement for the trip: My pack fits two bear canisters while still being able to close! I was expecting to have to strap one canister to the outside of the pack and am so grateful that won’t be necessary. I’ll take notes and pictures while I’m away and report back on how the trip goes – hope this info helps someone else take on the challenge of solo backpacking. I’ve added some John Muir essays to my Kindle to really get in the spirit of things while I’m up there. It occurred to me the other day that I was approaching this trip like I do most time off: planning out every minute of how I was going to enjoy the time. Instead of trying to force myself to a rigid schedule or expected accomplishments, though, this time I’m going to push myself to just look at each day as its own time and see what happens.